One of the world famous 1804 Draped Bust silver dollars recently sold at a major auction in the United States for $3,290,000 million. It becomes one of the most expensive coins ever sold and earned the second-highest price ever paid for one of the classic silver dollars known as "The King of American Coins." The coin collection, once owned by real estate developer A. Mack Pogue and his son D. Brent Pogue, sold for a total of more than $100 million. The buyers of this specimen of the 1804 dollar, which is known as the Dexter dollar, are California coin dealer Kevin Lipton and John Albanese, a cofounder of the Professional Coin Grading Service (PCGS), founder of the Numismatic Guaranty Corporation (NGC), and president of Certified Acceptance Corporation (CAC). "In coins, everybody's heard of the 1804 dollar," said Q. David Bowers, chairman emeritus of Stack's Bowers Galleries, which sold the coin. "It's what I call the ultimate trophy coin." Those buyers then flipped the 1804 dollar to an agent, who in turn sold the coin for an undisclosed sum to renowned collector Bruce Morelan, who is perhaps best known for having assembled the world's finest date set of early American dollars. The Dexter 1804 dollar completes his run of silver dollars that also includes the world's most valuable coin, a 1794 Flowing Hair silver dollar that he bought in 2013 for $10 million. There are only 15 known 1804 dollars, and just eight like the kind that sold for $3.3 million on March 31, 2017. The type that sold in March is known as a Class I 1804 dollar, meaning it was from an original group of 1804 dollars that were struck as presentation pieces in 1834 or 1835 for inclusion in special proof sets that were given to government leaders overseas as diplomatic gifts. While Draped Bust dollars don't presently hold the all-time price record, they have claimed that lofty title in the past. In 1989, the Dexter specimen of the 1804 dollar sold for $990,000, which was then the all-time record price ever paid for a coin. A decade later, in 1999, another specimen of the 1804 dollar crossed the auction block for $4,140,000, claiming another world record. 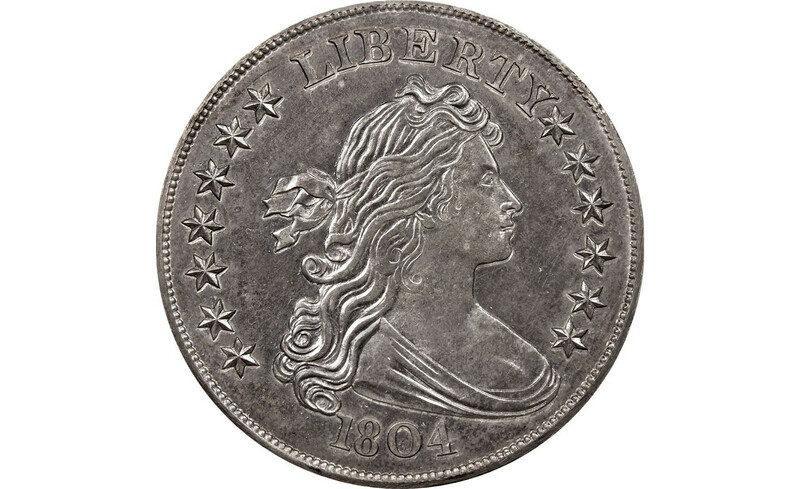 1804 Draped Bust dollars have long been the stuff of numismatic lore, representing what many coin collectors might refer to as the holy grail of the hobby. Perhaps that's exactly why Denver banker John Vila Dexter bought the coin at an auction in Philadelphia during 1885 . He paid $1,000, which was then a record price for any coin. Dexter later carved a small "D" in one of the clouds on the reverse of his 1804 dollar, and this is in part how many experts authenticate the provenance of this coin. The 1804 Draped Bust dollar is financially out of reach for the vast majority of coin collectors. This is in part why the Draped Bust dollar is so popular with coin collectors today. 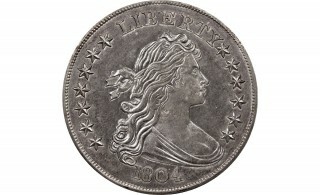 The 1804 dollar is often regarded as the famous poster child of the Draped Bust silver dollars, which has long been one of the most widely collected of the early American coin series.